I am interested to know how the lavatory paper gets dispensed. Does it come out freely, with no resistance, or is this a single sheet dispenser so that one tug will produce only one sheet and any further sheets will be able to be obtained with subsequent tugs? This twin toilet roll dispenser is freely dispensing. It is designed for use with a majority of conventional style toilet rolls. It's design enables storage of two rolls and allows the second to fall cleverly into place upon exhaustion of the first. Hi can i ask what it would need to attach to and how it would be attached does it need to be screwed in etc? This dispenser is supplied with the required fixings (screws & wall plugs). This dispenser will need to be screwed into the wall. Significantly reduce the need for replenishment in your washroom with this Twin Toilet Roll Dispenser. Designed in-house, this unit has been constructed from a durable plastic that can be quickly wiped clean. A blue display window allows the user to easily identify when replenishments are needed. The entire front casing has a self-locking design that can be accessed with a universal key - perfect for any environment where lost keys are commonplace. When fully loaded, it can hold 2 toilet rolls at any given time while allowing you to remove the desired length of paper. The compact toilet roll dispenser has a small footprint which is ideal for time-poor washrooms. 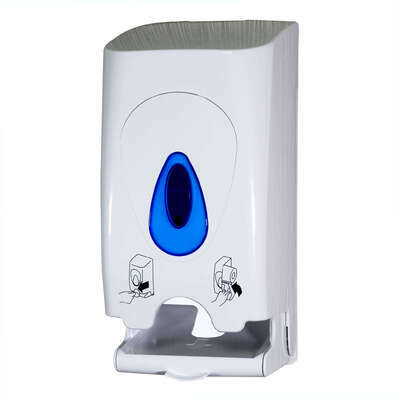 This dispenser can be used alongside our Gompels Double Length Toilet Tissue 400 Sheet 2ply 60 Rolls and our Gompels Toilet Tissue 320 Sheets 2ply 36 Rolls.